A while back I came across some photos from World War II amongst an old uncle's possessions. 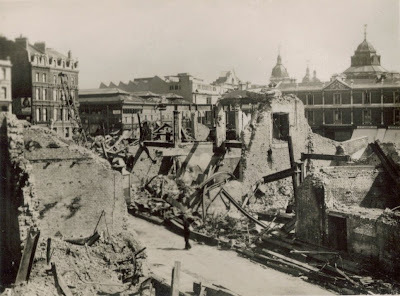 The ones that impressed me were of St.Paul's Cathedral in London standing amongst the bomb damage that destroyed so much of the surrounding area. It always amazed me how St.Paul's remained virtually undamaged despite the bombardment of London in the blitz. Many put this down to the hand of God protecting the cathedral. "St. Paul's Cathedral became an inspiration to the British people during World War II. 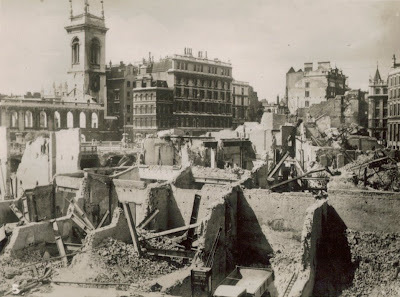 In the Battle of Britain, the Luftwaffe attempted to bomb Britain into submission by pounding London and other major cities, but St. Paul's miraculously escaped major bomb damage, even as historic buildings nearby were reduced to rubble. Images of St. Paul's framed by smoke and fire became a symbol of Britain's indomitable spirit." One of the conspiracy theories as to how St.Paul's remained standing was that the Germans did not bomb it on purpose. Why? Because on a moonlit night the dome acted like a beacon to guide their planes during the blackout. This doesn't, however, ring true to me. What is interesting though is the fact that St.Paul's is on a ley line which links the likes of St.Clements, The Temple Church, then St Paul's Cathedral at Ludgate Hill, St. Helen's at Bishopsgate and St Dunstan's at Stepney. Further digging shows that the Cathedral is built on an ancient site. The present building was started in 1675 and finished in 1710 but there had been three known previous buildings. The first cathedral was built in 604AD. Prior to this it was the site of a Roman Temple to Diana. There is speculation though that much earlier than this - where St.Paul's is built on Ludgate Hill - there was once a stone circle. 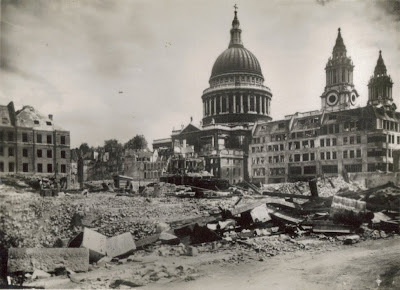 So was St.Paul's Cathedral protected in World War 2 by an important energy point? Fanciful perhaps but how else could it have remained upstanding when all around was being flattened? There are more World War 2 photos and memorabilia on my Squidoo lens World War 2 Photos. A Coincidence? The top of the cross on St.Paul's Cathedral is 365 feet high - the number of days in a year. It's probably not to a coincidence though, and was most likely designed this way by Sir Christopher Wren. So ley lines protect! Really cool post. I didn't realise that about St Pauls being missed when all around was bombed. Does seem odd, doesn't it? Very much Suzie, as if they were told not to. or how many bombs hit Buckingham palace? Most of the damage around St. Pauls was done by incendiary bombs. It was hit by 3 HE including 1 500 pounder. The cathedral's layered roofs protected it from most of their damage. One did penetrate into the crypt and injured the fire crew. Every single stained glass window was broken. Which was odd because Wren designed it to have clear glass windows. All the broken windows were later replaced with clear glass. 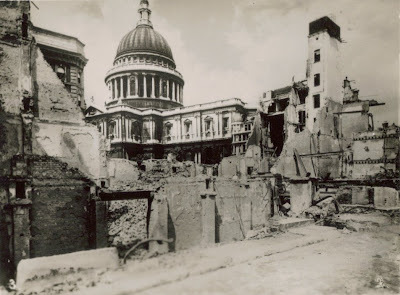 There was a fire crew assigned the sole purpose of protecting the cathedral, 40 men who slept in the crypt for 2 years, on Dec 29 1940 alone they removed 39 incendiary bombs from the roof of St Paul's. That is the night that most of the building around the cathedral burned down. I would posit that it was by the brow, sweat, and blood of Londoners that St. Pauls escaped with so little damage. What happened to all of the old stained glass windows? Were some repaired and now remain as port of St Paul's Cathederal? Would old salvaged pieces of stained glass be valuable? Yeah...well God brings the Bulldozer and we bring the shovels! Anonymous and Suszie shine, if you guys have no brain then of course you ae not going to know how much culture Italians had and how much intelligence they had as they wanted to protect something sacred to them. Good for them!